Jose's Art Journal: Tale of two cities. I have been painting in some "iffy" parts of town lately. All by my own. Not the smartest thing since a painter is like a sitting duck waiting to be pounced on. In one particular corner pictured below , a woman took pains to explain that I shouldn't be standing in the same spot where they gunned her son down... I did linger a little longer but I had to finish the painting at home because every car became suspect after the news. 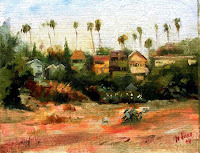 Last weekend I painted some beautiful Victorian homes from the Arroyo Seco Park and I had a quiet spectator, a drunk who didn't say a peep but sat for a whole hour taking swigs at some brown-paper bag wrapped bottle. A little unnerving. 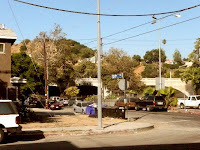 By the way, if San Francisco has the "painted ladies" I think Los Angeles should have its own and these houses from the Arroyo are perfect candidates . 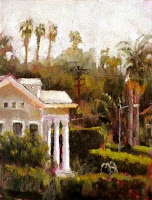 I also have painted in this some posh spots like Wattles Park in Hollywood. It was beautiful and quiet but people tend to look at you with more suspicion in the well-heeled hoods' until you actually start painting and you stop making strange gestures , pacing back and forth and hand-framing. I just spent some time looking through your blog... WOW your work is beautiful!